The Helms Bakery will reopen under the direction of award-winning pastry Chef Sherry Yard. Currently under construction, the revitalized Helms Bakery will feature a multi-space layout including a full-service restaurant for breakfast and lunch, a dedicated bakery with counter for prepared foods, as well as, retail specialty products. From its inception, the bakery was a pristine showplace and a model for mass production. Bakers baked on a large scale, creating breads, cakes, pies, wedding cakes, doughnuts, cookies, and even cream puffs — over 150 items in all. For all of its organized chaos, not a crumb was ever out of place. Tour groups were invited to watch as ingredients were poured, mixed and kneaded by the ton. By 1965, the bakery consumed 780 train carloads of white and wheat flour on an annual basis. Over two million eggs were used in a single month, and at holiday time, enormous quantities of fruit and nuts went into the batter. All this, of course, required 1,798 miles of wrapping paper. First opening its doors in 1931, family-owned and operated Helms Bakery supplied local residents with its fresh-baked bread delivered daily at your door for over four decades. The Helms trucks, nicknamed coaches, became a ready fixture along Los Angeles streets. And, the Helms Bakery building remains a cherished local landmark, recognized for its architectural significance. As much a promoter as a businessman, Paul Helms quickly thrust his local bakery onto the world stage. 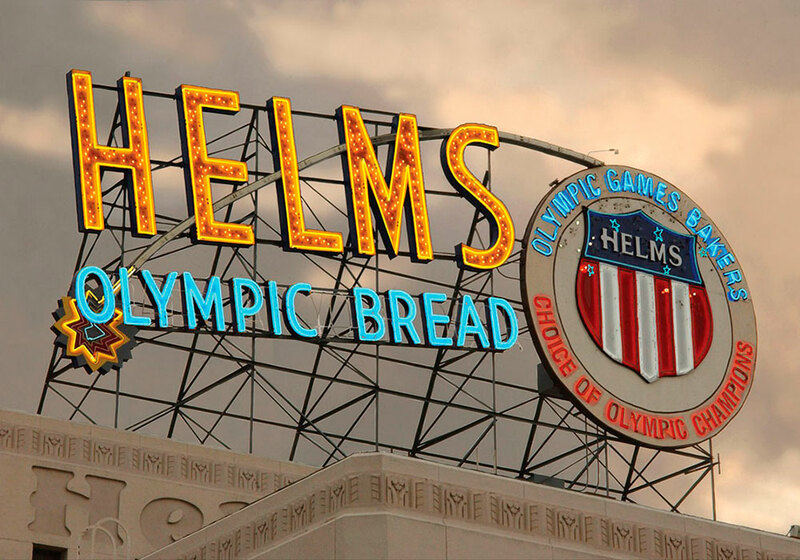 Helms bread soon became the choice of athletes and astronauts, presidents, kings, and Rose Parade queens, chalking up honors that defined an era. Beginning with its designation as Official Bread of the 1932 Olympic Games in Los Angeles, the meteoric rise all but ended with the historic Apollo landing in 1969. At the 1934 California State Fair, it won the first gold medal for bread. Through the years its floats collected ribbons in the Tournament of Roses Parade. 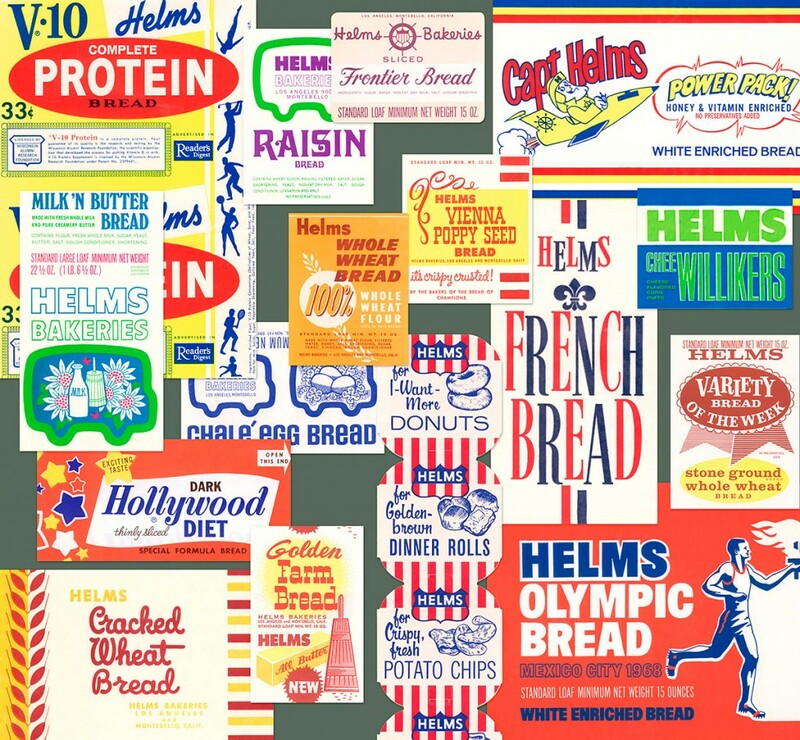 In the early days of broadcast and again ahead of its time, Helms was on the air as sponsor of a hugely popular radio and television cooking show featuring Helms baked goods. Jane Sterling, the host of the Tricks and Treats show, appeared as Helms home economist Coris Guy, the Martha Stewart of her day. Just months before the bakery closed, Helms Bakery supplied Apollo 11 with its life sustaining bread, thus becoming the first bread on the moon. And soon, you can once again enjoy the goodies provided by Helms Bakery. A preview of the sweet menu is available from our vintage Helms coach outside on Thursdays from 1p – 5p; and Friday, Saturday, Sunday from 12p – 4p. This entry was posted on Tuesday, June 14th, 2016 at 12:23 am	and is filed under Blog by Manny Pacheco. You can follow any comments to this post through the RSS 2.0 feed. Responses are currently closed, but you can trackback from your own site.